It’s made from a birch polypore mushroom. Our ancestors realised that you could get this tough bracket fungus off birch trees, hollow it out and put fire in it and carry it for days. This enabled the portability of fire that is so critical for human survival. When the same mushroom is boiled and stretched, it produces a fabric. There are only a handful of people in Transylvania who are making these hats now. Because of deforestation and the difficulty of finding large-enough mushrooms, the hats are becoming very rare. What started your fascination with mushrooms? The biggest problem in my life at the time was a bad stutter. It was a social phobia that made dating girls really difficult. So I started repeating a mantra: “Stop stuttering now, stop stuttering now.” On my way back, I ran into a girl who I liked a lot but was always too shy to talk to. “Hi Paul, how are you doing?” she asked. I answered, “I’m doing just great!” That was basically the end of my stuttering. How do you think this stopped your stutter? Recently scientists have discovered that psilocybin stimulates neurogenesis – it helps build neurons. I believe that’s what happened to me; that it helped to remap a neuronic pathway in my brain. Have mushrooms given you anything else? Yes, what mushrooms have taught me is the interconnectedness of all life forms and the molecular matrix that we share. 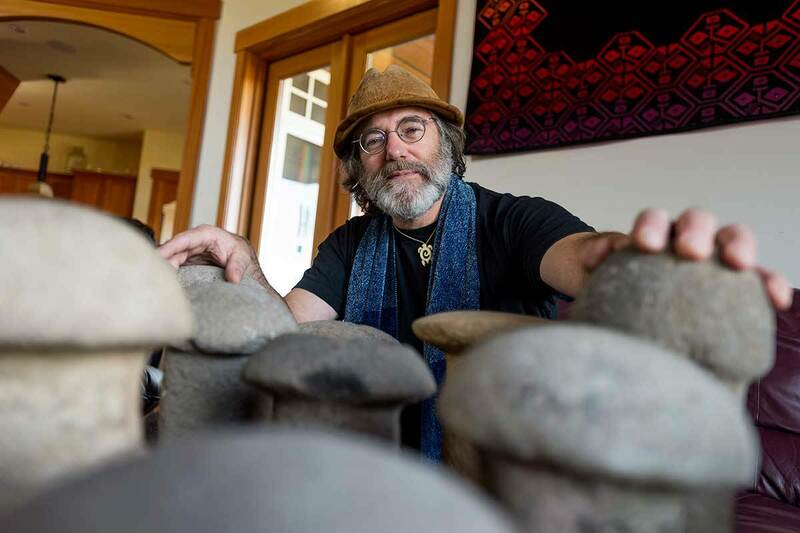 I no longer feel that I am in this envelope of a human called Paul Stamets. I am part of this stream of molecules that are flowing through nature, that are becoming eddies of life. I am given a voice, given consciousness for a time, but I feel that I am part of this continuum of stardust into which I am born and to which I will return at the end of this life. Many people in Western culture are almost afraid of mushrooms generally. Why is that? Many people are mycophobic [mushroom fearing]. People from Japan, from Eastern Europe, from China, from Mexico, they are much more mycophillic. In the West, we see mushrooms as signs of decomposition and death, whereas in Asia mushrooms symbolise regeneration and rebirth. That is a cultural chasm we are now crossing. Do mushrooms have medical potential? After 9/11, the US Department of Defense (DoD) was worried about an attack by biological weapons, especially one using weaponiseable bacteria and viruses. As part of the Project Bioshield programme I submitted more than 500 mushroom extract samples to see what might work as a defence. We got the best results of all the hundreds of thousands of samples submitted, including pharmaceuticals, against a variety of viruses like cowpox, smallpox, herpes and flu. We were once forest creatures. With the advent of agriculture, roughly 12,000 years ago, humans embarked on deforestation, inadvertently unravelling immunological mycelial networks that have protected us and others for aeons. Viral diseases that have jumped from other animals to humans, such as bird flu and Ebola, are signs, in my opinion, of this loss of forested habitats and the corresponding mycodiversity. Can mushrooms offer protection to animals? Bracket fungi immunologically protect, and connect, the animals of forest lands – from bees to birds, bats, bears, pigs and people. For example, I was growing mushrooms on a compost of wood chips, and was surprised to see that the bees had pushed the wood chips aside and were sucking on the branching, vegetative part of the fungi, called the mycelium. It turns out that bees and maybe other organisms use certain anti-fungal compounds found in decomposing wood to detoxify themselves. Without the fungi, the bees can no longer rid themselves of fungicides, herbicides and other poisons, so they get sick. The company I started, Fungi Perfecti, has now developed “myco-honey” using extracts derived from mycelia. When bees eat it, their viral counts plummet, they live longer and the colony increases its survival capacity. How do fungi destroy toxins? The DoD wanted help breaking down a neurotoxin that Saddam Hussein used to kill 20,000 of his own people. A lab they were working with approached me and asked if I could train mycelia to break it down. I gave them cultures of 28 species and instructed them to increasingly expose these to the toxin over time. Within six months, two of the strains I had given them had adapted to that neurotoxin as their sole nutrient source, and produced enzymes customised to break it down, eating the toxin and rendering it harmless. Mycelia constantly learn from their environment. They can help remediate oil spills, and break down pesticides and herbicides. I am convinced that there is not yet a single carbon-based toxin that we could not train mycelial networks to break down. What else could mushrooms be used for? Some 400 million years ago there was a 10-metre-high fungus called Prototaxites that dotted the landscape – the tallest organism on Earth in that era before vascular plants. Future space pioneers should carry mycological communities with them for terraforming other planets: to break down the rocks, help bring minerals into plants, and set up the biodynamics of an ecosystem. Could mushrooms restore our own planet? Mushrooms and their mycelia can rehabilitate habitats that have suffered traumatic impacts from pollution or deforestation. I call mushrooms soil magicians. These are the grand recyclers of nature, instrumental in the decomposition that creates the soil that gives rise to biodiversity. One avenue for tackling global warming is to use mycelia to build up the carbon sequestered in soils. For example, about 30 per cent of the biological carbon in the soil of mature forests is fungal in origin. This “mycomass” can hold far more carbon than most trees. You call the vast underground networks of mycelia Earth’s “natural internet” and claim they are intelligent. Do you stand by that? Do you feel that science has underestimated the importance of fungi? Absolutely. Prejudice against them has permeated the sciences: it is a form of biological racism. On the plus side, this general avoidance of mushrooms has left the field wide open for me – and a few others – to explore.